You probably already know that the Dodgers announced their 2016 Opening Day 25-man roster over the weekend. Nevertheless, I figured I'd outline the guys who will be manning the club to start the season in a post. There are quite a few surprises, but only because several key injuries have opened the door for some new faces. 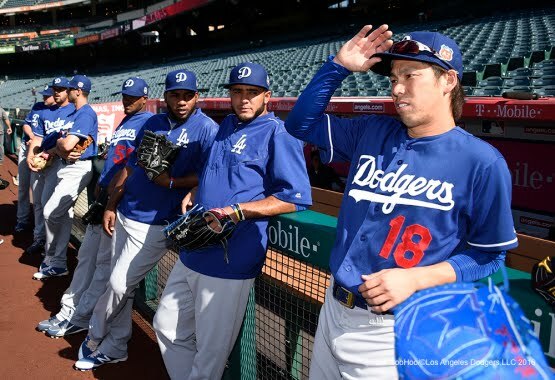 Here is the Dodgers 2016 Opening Day roster. The rookie and first time Major Leaguer, Ross Stripling, beat out Carlos Frias and Zach Lee for a spot on the rotation. His stay is likely to be a short one. Stripling will probably go back to minors once either Bolsinger or Ryu is ready to go. The Dodgers will go with just one left-hander in the bullpen, at least for now. Avilan and Liberatore (both lefty's) will be waiting in the wings in the minors. Louis Coleman earned a spot by having a fantastic spring. Barnes makes the team due to Yasmani Grandal going on the DL. Culberson earned a spot over Rob Segedin for an infield position left open by the injury to Alex Guerrero. It remains to be seen if Guerrero takes back the spot when he is ready to play. Trayce Thompson, son of former Laker Mychal Thompson, earned a spot due to Andre Ethier's injury. Photo at the very top of Kenta Maeda, Yimi Garcia and Pedro Baez via Jon SooHoo/LA Dodgers 2016.